What we in the industry call “White Knots” refers to tiny little knots that may be barely visible throughout an area rug. These white knots are typically white, but can actually be different colors, based on what color yarn was used when crafting the foundation of the area rug. These knots are hidden within the pile of just about every hand knotted area rug made. 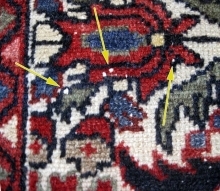 These knots show up in hand knotted area rugs due to spots in the rug where the foundation yarn broke. This happens as the rug weaver is crafting the rug, while it is stretched out over the loom. The two broken ends of the woven yarn are just tied back together, which in turn forms the (typically) white knot. After the break in the yarn is repaired, the weaving of the area rug continues. These white knots are usually hidden within the pile and not always noticeable. However, as the pile begins to wear or mat down over time, due to standard wear and usage, the knots begin to show a bit more and more as they get closer to the surface of the pile. The lower the pile gets, the higher the knots seem and that makes them much more visible to the naked eye. The white knots that begin to show themselves are overlooked often by the area rug owner, until the rug as been professionally washed. 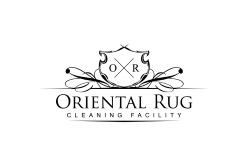 This is mostly because once the area rug washing process has been performed, the knots are usually clean, bright and much more easily visible. Standard usage will lead to a buildup of debris and soil on the area rug which effectively hides the white knots to the naked eye. 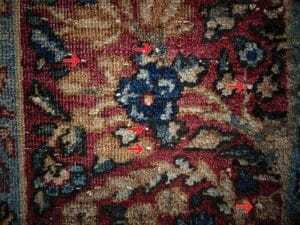 An often unnoticed function of these knots is an indication of rug pile wear. The knots show themselves as the rug pile wears down. 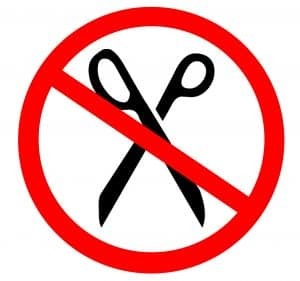 Always remember to never cut those white knots! Being that these knots are holding very important foundation fibers together, cutting a white knot can let the fibers pull themselves apart, which will eventually create a hole in the rug. White knots are essentially a good sign. When you see these white knots, you know you have a nice, authentic, hand knotted area rug. However, if you consider them to be an annoyance to your view of the rug, you can do something about them. 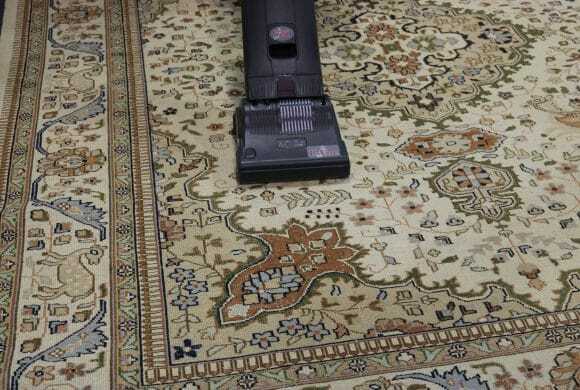 If you feel it is necessary to rid your rug of white knots, you can have them re-piled. Re-piling is an expensive method of repair, but it is permanent. A more cost effective repair method is to have a professional touch them up using a dye that matches the particular area of the rug. This method is typically much less expensive, but is only a temporary fix. 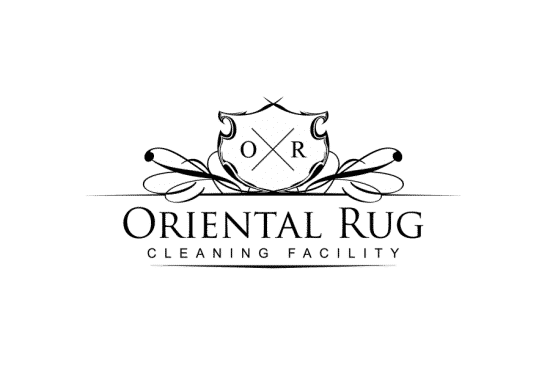 If you notice white knots in your rug before or after the cleaning service and have some questions about them, reach out to us HERE at the Oriental Rug Cleaning Facility in Tampa and we would be more than happy to help in any way that we can! Our friendly staff are always happy to help!